Editor's Note by Christopher Caile: This article appeared in the September 2009 issue of Finnish martial arts magazine Budoka appears here in two parts. 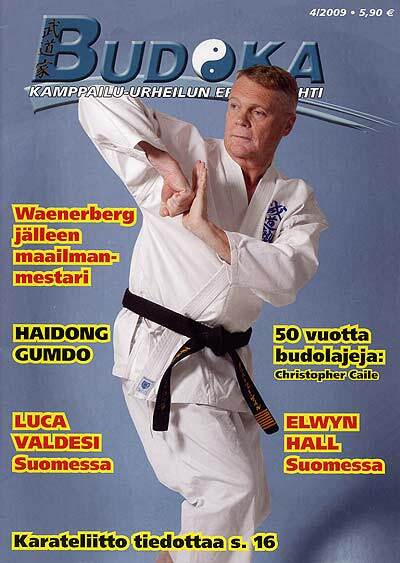 The author, Jarmo Osterman, initially contacted me for an interview about my introduction in 1960 of karate into his country, but the interview quickly expanded. Osterman edited my responses and produced two articles, the first in Budoka and a second in another Finnish martial arts magazine, FightSport. In 1960 Christopher Caile introduced karate into Finland for the first time. Now living in New York City, Mr. Caile primarily practices karate and aikido. In addition, he has practiced judo, aikijujutsu and several kung fu styles. First introduction page of the Budoka article on Christopher Caile. 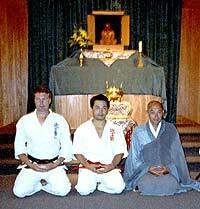 Christopher Caile (at that time Sensei, 4th dan), Seido Karate’s founder, Kaicho Tadashi Nakamura, and John Daido Loori, the Abbot of Zen Mountain Monastery. The photo was taken after a session of Zazen meditation in the summer of 1991. The monastery is situated in the Catskills mountain region, two hours by car north of New York City. Christopher Caile sits with his friend, Tadashi Nakamura (1961), in Nakamura’s home near Tokyo. At that time although Nakamura was just a 2nd dan in Kyokushinkai karate, he already stood in as a substitute teacher for Mas Oyama (the style’s founder) when Oyama was otherwise engaged. Christopher Caile started practicing martial arts in 1959 while attending Bradley University in Peoria, Illinois. During his freshman year in college he took a gym class in judo and wrestling. Soon afterwards he joined a local judo dojo run by Douglas Grose. It was there that he me Phillip Koeppel with whom he started karate. Mr. Koeppel had been a student of Kajukenbo (a hybrid martial art that combines karate, tang soo do, judo, jujutsu, kenpo and kung fu) in Hawaii. While in Japan he also studied Wado-ryu karate and practiced Shorin-ryu karate with Richard Kim. Currently Koeppel Sensei (10th dan) heads his own international United States Karate-Do Kai karate organization headquartered in Peoria, IL. 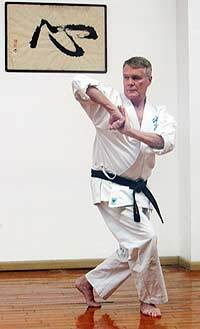 He now teaches Matsumura Seito Shorin-ryu Karate which is based on the karate style of the great Okinawan Karate teacher Hohan Soken (a student of the grandson of Bushi Matsumura – a hard Shorin-ryu karate style mixed with softer White Crane techniques). Before starting his own organization Koeppel had served as District Manager of the United States Shorin-ryu Karate Association established by Robert Trias who has often been called “The father of karate in the US”. Later, searching for the roots of karate, Koeppel traveled to Okinawa and became associated Fuse Kise Sensei and later Yuichi Kuda Sensei before breaking out on his own. 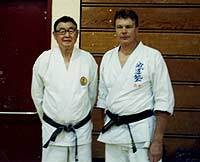 “Both of these Sensei had been senior students of Hohan Soken who now head their own karate associations based on Hohen Soken’s karate and kobudo legacy, ” Caile explains. Later (in White Plains, NY) Caile studied (and taught beginners in) Shotokan Karate. He was awarded a brown belt in that style. In 1960 Caile traveled to Europe to attend the Olympics in Rome, Italy, and then traveled around Europe ending up in Finland. Christopher Caile and the founder and the head teacher of Hakuho-ryu Aikibudo, Shogen Okabayashi sensei (originally his style was named Daito-Ryu Hakuho Kai Aikijujutsu but was changed). 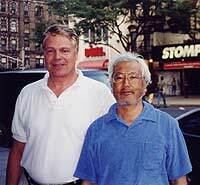 The photo was taken in New York City during Okabayashi Sensei’s visit in 1992. Okabayashi is a primary inheritor of one of Japan’s oldest martial arts, one that was passed down over centuries through the Japanese Minamoto clan and that became the technical basis of the modern budo art of aikido. In 1960 when Caile arrived in Finland karate training was informally practiced by a few but was not organized. Arriving in Helsinki Caile started training in judo at the Finnish National Judo Association dojo where he met Jussi Ikonen, the judo instructor who was also a karate enthusiast. Ikonen invited Caile to share his small one room apartment in Tukholmankatu, Helsinki, where Caile would demonstrate various movements and both would practice karate. The apartment, Ikonen once commented, looked like a war-field after their training. Caile soon began teaching karate at the Judo Association, where he also took part in its 1960 Judo Championship Tournament, playing fourth. Ikonen recalled that Caile was a natural karate-ka. He was always practicing his karate moves and would continually punch his knuckles against hard surfaces, such as stones and walls. Caile advised Ikonen to do the same. The best known Finish karate student during Caile’s stay is probably Kyösti Korpiola who went on to become a master of judo. Caile promoted Korpiola to 6th kyu in karate. The following year he and his brother, Simon Korpiola, gave a demonstration of karate, judo and jujitsu in Niinisalo. After spending six months in Finland, Caile decided to go to Japan where he would hopefully link up with Ikonen who promised to come there too. Having saved up just a little money, however, Caile decided to hitch hike. Traveling for over a year Caile traversed Scandinavia, Europe, North Africa, the Middle East, and Asia. Several years later, Ikonen did travel to Japan, but Caile had already left. But Ikonen returned home via the United States. Landing in California he traveled across the country and met Caile again, staying with him at his family home outside New York City. Roy Suenaka Sensei (8th Dan) shows Christopher Caile a tuite-technique (the Okinawan art of grabbing, seizing and controlling) he learned from the Okinawan karate master Hohan Soken. A long time student of Soken, Suenaka still teaches Soken’s art through his own Matsumura Seito Hakutsuru (White Crane) Shorin-ryu Karate-do organization based in Charleston, South Carolina. 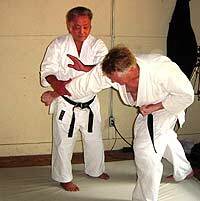 Also a master of aikido (Wadokai), Suenaka often demonstrates these techniques in his aikido classes and seminars. Caile is an aikido sensei in this organization. As part of a group photo, Christopher Caile poses with Kisshomaru Ueshiba and Moriteru Ueshiba, the son and grandson of Morihei Ueshiba, the founder of aikido. The photo was taken in 1994 when Caile and other aikido students accompanied Roy Suenaka on a visit to the Aikikai Honbu Dojo in Tokyo. As a youth Suenaka was an in-house student of the founder (as well as Tohei Sensei) and became friends with Doshu Kisshomaru, Seito Sensei and others who went on to became leaders of aikido in Japan. Caile visited many of these teachers with Suenaka. In Tokyo, Caile made contact with Donn Draeger (the famous martial arts historian, writer and practitioner) who offered Caile accommodations in his house in Ichigaya where several other judo practitioners lived (several of whom became members of the 1964 US Olympic Judo team). Caile remembers Draeger as being a very serious martial artist. Sometimes until late at night he and Draeger would discuss the history of budo, traditional martial arts and philosophy. In the morning Caile would often join Draeger for practice of judo and Shinto Muso-ryu Jojutsu (a short stick art once used by Samurai in law enforcement against the sword). They also lifted weights. With the help of Mr. Draeger’s introduction and recommendation, Caile started training with Mas Oyama three days a week in his Ikebukuro dojo that was housed in a dance studio (Oyama’s first dojo). Caile was the only westerner practicing there. At this time there was only one other Kyokushinkai dojo in Japan (also in Tokyo), headed by Sensei Kenji Kurosaki (5th dan). Caile trained there two evenings a week. On Sundays, Caile would accompany Oyama to Camp Zama (outside Tokyo) to teach US military personnel. Oyama, Caile noted, was very generous, acting almost like a father figure. Oyama helped him with clothing and didn’t charge for training. After training, Oyama would take Caile out to dinner, or invite him back to his house to eat with his family. Many evenings too they would travel to Sensei Kurosaki’s dojo to work on photography for Oyama’s forthcoming book “This Is Karate” in which Caile appears. During his first class in Kyokushinkai, Oyama took Caile aside to introduce him to a young Japanese student, Tadashi Nakamura. He asked Caile to teach him English. In Japan Caile also befriended Yasuhiko Oyama (not related to Mas Oyama). 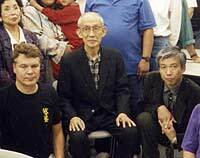 Several years later Caile got to know Shigeru Oyama (Yasuhiko’s brother) after he followed Nakamura to the States where Nakamura headed the North American Kyokushinkai. In 1976 Nakamura resigned and started Seido Karate. Shigeru Oyama took over the North American organization from 1976 to 1985 at which time he also left to form the World Oyama Karate Association with his brother, Yasuhiko. Before Caile returned to the US, Mas Oyama asked him to visit his US Kyokushinkai dojos as his representative and report back to him about the status and level of technique being taught. Later in the year Caile returned to college in Peoria, IL, and as a Kyokushinkai Branch Chief began teaching. Later while in graduate school at American University in Washington, D. C. he continued to teach Kyokushinkai. 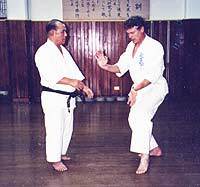 For a while too he taught a program with Ernie Estrada (who has become a well respected Shorin-ryu karate teacher, 8th dan, and noted karate historian) that taught both styles. Karate master Eiichi Miyazato Sensei giving a private karate lesson to Christopher Caile in his Goju-ryu Jundokan organization’s karate headquarters in Naha, Okinawa (1964). Caile practiced on a one-to-one basis with Miyazato Sensei (as well as taking classes) during his research on Goju-ryu kata. Miyazato (now deceased) was one of the top inheritors of Goju-Ryu Karate. He was the longest term student of Chojun Miyagi, the style’s founder. 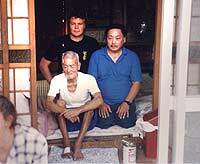 Hohan Soken´s son, Roy Suenaka Sensei and Christopher Caile sitting in the doorway in Soken´s family home in Naha, Okinawa. Soken’s son remembered Suenaka training in his house with his father and kindly allowed Caile to photograph some of his family photos. In 1969 Caile moved to Buffalo, NY and continued to teach Kyokushinkai. Around this time Tadashi Nakamura came to the US to head the North American Kyokushinkai organization out of New York City. Caile could only study and meet with his friend occasionally. In 1976, however (believing Oyama had strayed from his original principles), Nakamura resigned from Kyokushinkai to found his own style, Seido Karate. Caile followed his friend and teacher in Seido and began teaching Seido Karate at the State University of New York at Buffalo (SUNY). Caile speaks of Nakamura as having not only incredible technique, but also as being a modern-day Samurai who lives by the principles of integrity, honor and respect. Part 2 of this article will covers Caile’s research into karate, comments on kata, his experience in aikido and aiki-jujutsu, his professional work experience, his return trips to Japan and Okinawa as well as comments to readers. A Note About This Article by Christopher Caile: This article was translated into English by Ms. Kristiina St. Croix from the text Jarmo had written in Finnish based on an interview he had conducted with me in English. At Ms. Croix’ suggestion the English translation she provided was edited for clarity and wording, to correct errors and to add supplemental information if needed. It should be also noted that websites are different from printed magazines, thus the format of text and photos within the articles appearing here can’t exactly reproduce the layout in Budoka. Jarmo Osterman has been a martial artist for over 34 years and has trained in many arts. His concentration, however, has been on karate, where he has studied seven styles, and jujutsu where he has studied six. He is a yudansha in both Wadoryu karate and Hontai Yoshin ryu jujutsu. He has also written several books in Finnish on budo and its history. In his professional life for over 20 years he has worked as a photojournalist for a computer magazine and a staff writer for several Finnish Martial Arts magazines. Kristiina St. Croix has been a student of Wushu Quan Kung Fu style in London, England, where she lived for several years. In that city she also served as a volunteer member of the Guardian Angels. Later she trained in Ashihara karate. Currently she is a teacher of yoga and is a staff member in a Finnish language school.